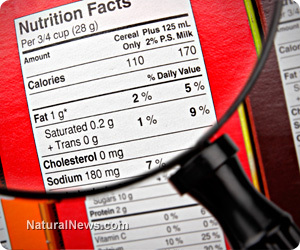 (NaturalNews) Typically, individuals concerned about health read labels and question if the food they consume will promote vitality and balance. So it's particularly disturbing when a hazardous ingredient is allowed to infiltrate the food supply under a misleading name that hides its true identity. Thanks to the Food and Drug Administration (FDA) and the Environmental Protection Agency (EPA), we now have monosodium glutamate (MSG) covertly present in food, as well as crops that are sprayed with a noxious pesticide riddled with the toxin. For those who believe buying organic produce and shopping at natural markets will protect you from this brain damaging, disease promoting agent - think again. If you experience migraine headaches, brain fog, weight gain or have hyperactive children, the culprit may be hidden within your favorite food. Also linked with neurological disorders, inflammation, diabetes, infertility and liver disease, MSG is a common additive which has serious health consequences. Take for example the hormone, leptin, which regulates hunger and satiety. When MSG is ingested, damage is caused to the hypothalamus region in the brain - thereby causing leptin resistance. Eventually, this important hunger taming mechanism will breakdown completely and the urge to eat will never stop. Another study at the Institute for Pathophysiology in Serbia discovered a correlation between MSG exposure during neonatal periods and lesions on neural structures and retinas in test animals. The researchers also noted an increase in neuroendocrine disorders such as stunted growth, obesity and infertility in later adulthood.